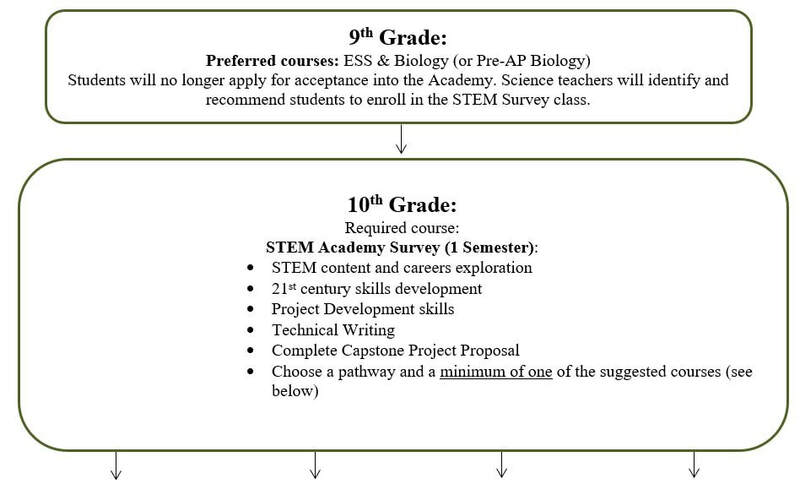 Students may also take ESS during 9th grade and then take both Chemistry and Biology during 10th grade. A student may wait until 11th grade to take chemistry but it will limit their science options. ​All students who decide to continue with the Academy after 10th grade will be required to complete a capstone project. The capstone project is completed by a team that may consist of students from other pathways. The capstone project does not have to focus on a student’s chosen pathway. A student can choose and is encouraged to do an internship or external work experience; however there is no guarantee of placement by the STEM Academy. Upon completion of the STEM Survey course, students may complete an internship through the PSD Post-Workforce Readiness (PWR) program. Internships typically happen in the summer between 10th and 11th grade, 11th or 12th grade, or both. STEM Survey (Science, Technology, Engineering & Mathematics) will introduce students to various theoretical and real life aspects of STEM content. Career overviews, 21st century skills required for success in STEM fields, technical writing, project design and implementation, and capstone project idea development will all be explored. Students will collaborate with mentors from the STEM community to enhance learning. This course is intended for students who may be interested in enrolling in the STEM Academy. This course is designed to introduce and develop a student's necessary knowledge and skills that are required to complete a culminating STEM Capstone project. The project will focus on STEM (Science, Technology, Engineering, & Math) related topics and the student must demonstrate 21st century skills. A major component of the project involves community mentorship. The seminar course also allows for time to collaborate with community members, faculty and other students while developing their project and portfolio.